This article is reproduced courtesy of Five-Dots and all images are courtesy of Maxime Van Melkeke. 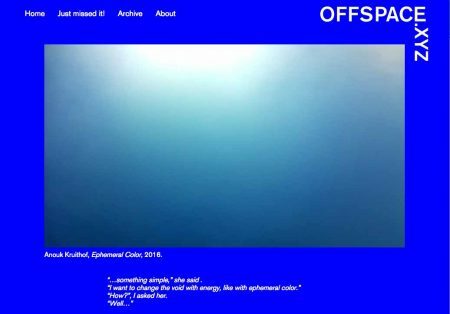 For this edition of Five-Dots, Megan got to chat with Maxime Van Melkebeke via email coorespondance over the past two months about his project Offspace.xyz. We won’t waste our breath divulging how great it was of an experience, we’ll just get on with the interview. Cheers, folks. Maxime Van Melkebeke is the curator for Offspace.xyz, an online project space that is currently based out of New York. When provided with the opportunity to utilize a studio space for whatever he saw fit, and without the ability to have other people occupy the space, Maxime decided that the space needed to incorporate an audience that was only allowed permission to view through the internet. Offspace.xyz has since then morphed, moved locations, and travelled across seas. The project still offers up questions about the performance of creating, how we view art, how the internet has grown into a specific location, and the voyeurism of perceiving art. Maxime is an independent curator who lives and works in New York. 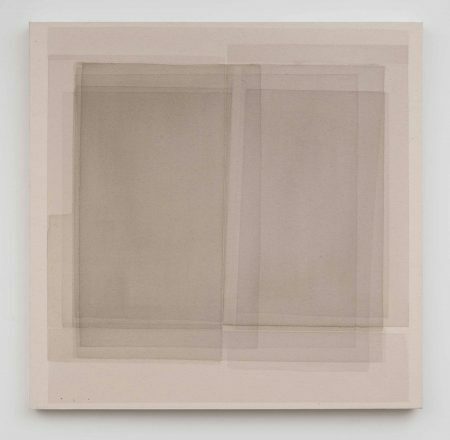 He received his MA in Contemporary Art History, Criticism and Conservation from Sotheby’s Institute of Art, New York and his thesis The Transformation of Human Identity through Perception received distinction for its original contribution to the scholarship on its subject. 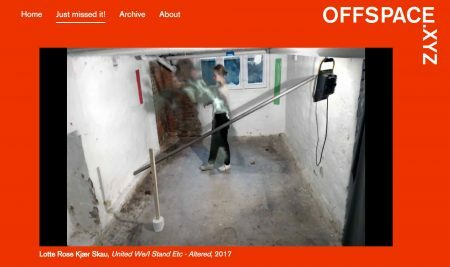 In 2016, Van Melkebeke started an online project space, Offspace.xyz. 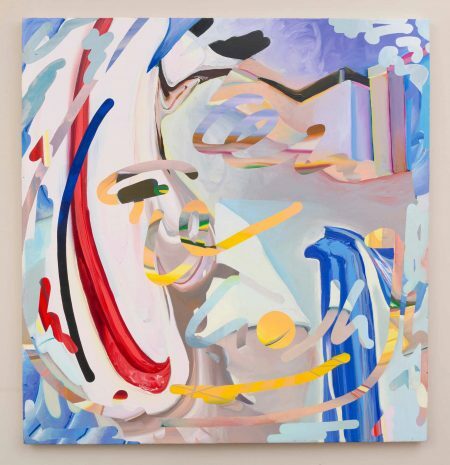 Recent exhibitions include A Stay in the Paphos Loop and solo projects by artists such as Tomaso De Luca, JAŠA, Anouk Kruithof, Olga Fedorova, and many more. He just finished a solo live streaming project on Offspace.xyz with sound and video artist Lotte Rose Kjær Skau in Copenhagen, Denmark. Anouk Kruithof, Ephemeral Color. 2016. screenshot of offspace.xyz. Image courtesy of offspace.xyz. Five-Dots: When was this gallery/project space established? Maxime: Offspace.xyz started as a curator-in-residency project in January of 2016. The first show went live January 15th of 2016. F-D: What program was your curator-in-residency project through? Was it also an online program? If not, what influenced your decision in creating an digital projection of a brick-and-mortar space? Maxime: The curator-in-residency project started through an artist friend, Anouk Kruithof whom wanted to set up a residency project in her studio that would be empty for a year. In the end she was handling too many projects at the same time and abandoned the residency project; but it left her studio empty for two months, so she allowed me to use it for my project [Offspace.xyz]. Before beginning the project I asked her what some of the constraints were [for the studio]. She told me that she couldn’t really ever have people over due to lease restrictions and constraints with the landlord; which led me to re-work my idea of an exhibition space. I decided that the traditional concept of an exhibition space would have to be turned inside out: instead of bringing people to the space, I brought the space to the people. I mean, there were many elements included in the decision making process, but I guess it just sort of made sense to live stream a space that people don’t normally have physical access to. It also opened up the possibility of working with instructions rather than physical work that needed to be shipped from overseas. So in many ways it also expanded on the concept of residency and exhibition space. I showed work by people who had no physical access to the environment or space in which their work would come to exist and be executed. Maxime: I founded the online project space in January 2016. I have been with it ever since. The location has moved a few times, from the Lower East Side in New York to Greenpoint in Brooklyn and currently in flux between locations in New York. I’ve also installed the online project space in Copenhagen, Denmark and am to set it up in multiple locations around the globe, focusing on a remote location in Iceland, and the cities of Dublin and Brussels. F-D: Who else is on your team? Maxime: For now, I’m the only one. I do get a lot of support from some friends. The artists I work with are super friendly and very helpful. I am looking to see how I can expand. I would love to have an intern to help me out with some day-to-day tasks, so I can focus a bit more on the bigger picture. Maxime: The project sort of started as an experiment. I began just trying to work with artists that were not physically present while utilizing instructions to create the work. It was super entertaining but also very demanding. In the end I sort of veered more towards working with artists in New York. t was just simpler arranging logistics and controlling technical aspects. I’m currently working on a project with an artist from Denmark, Lotte Rose Kjær Skau, where we live streaming from an alternate location. Live streaming directly from studios, residencies and remote locations is a new component to the online project space. F-D: Do you think that that [broadcasting directly from the artists studio] is where you would like to go with the project? Or are you hoping to utilize both an experimental project space and artist studios? Maxime: I mean, what I’m doing now is showing that it is actually feasible to set this up anywhere one wants. If Offspace.xyz continues to be successful I hope to be able to work with different spaces around the world. Some of which I will have direct physical access and will allow me more control over the process, content, and programming. I always felt that the mobility of the experience for the viewer and the mobility of the set up for an exhibition could go hand-in-hand; or could at the very least compliment each other. The artist studio shows a creative process while the experimental gallery space shows a different setting. I also have a setup in my apartment. Every space and set up becomes sort of unique and allows for a better integration or fine tuning of the ‘exhibition’ concept. So I guess, to answer your question, I’ll do a few more experiments and then see what is manageable. I would love to have shows up during art fairs or biennials, but these shows don’t really have to be in the same location(s). It becomes an extended or expanded space. Shawn Kuruneru, Teleporation, 2016. Image courtesy of offspace.xyz. F-D: What is this project space’s main goal or function? Maxime: There isn’t one singular goal, but there are many goals that can be achieved at the same time. One that I think is important—but might be a bit ideological— is for Offspace.xyz to be a bridge between communities, distributing and showing the work to a broader audience without the limit of physical presence. We are used to looking at so many things through the lens of our camera and staring at our screens, and I am very interested in that representation. The viewer is also forced into a voyeuristic position by looking at security camera footage that is being live streamed. Another goal is to offer the artists a way to experiment with different modes of presentation, some physical and some not. There is a loop of interconnectivity through the translation of something physical to something digital and vice versa with the work of some artists— which is interesting to consider. I guess to summarize, the large goal is to create a one on one relationship between the viewer, the space, and the work being showed through an alternative presentation: live streaming. F-D: There is also the visual archiving that is happening because of the documenting and streaming the act of creating? Is archiving something that is interesting or relevant to Offspace.xyz? F-D: Has the location of the project space influenced your work selection or selection process in any way? Maxime: The location is both secondary and not with it being both accessible globally, 24 hours a day online, but physically unaccessible— all while maintaining physical spaces—it’s important to retain a certain aspect of vicinity to be able to produce all the shows. Again, I would love to have shows in multiple locations, so that’s something I’m working on. I have said before, the selection of the work primarily was based on the mode of execution, then it changed to locally based artists. I’m trying to return to having more locations and tapping into local scenes spread out in the world. Maxime: A typical day is going off to work (I work full-time at a gallery in Chelsea) and when there is some spare time I get to spend that time working on Offspace.xyz. It’s tough, but I love it. Most of my work for Offspace.xyz is done on the weekends or after hours. I tend to go to studio visits, prepare upcoming exhibitions, and visit shows in my down time. I would love to spend all my time on Offspace.xyz, but I have to be able to eat and Offspace.xyz can’t fully support that right now. Oh and before I forget, like so many people, my typical day starts by checking Instagram, checking my emails, grabbing a coffee and then leaving for work. F-D: If you don’t mind sharing, which gallery do you work for? Are there any overlap in responsibilities between your day job and your actions with Offspace.xyz? Maxime: I’d rather not. Everything that happens with Offspace.xyz: every word, document, Instagram post, and email that goes out has passed through my hands or has been written by me. There are a lot of things that I do at the gallery that made me pay attention to certain details for Offspace.xyz; but in general both operate differently. Maxime: I tend to be attracted to three or four different objectives: how the artists see themselves using space, how they interact with technology in their work. or how they think about the world we live in and the division or overlap between our ‘physical’ lives and our ‘virtual’ lives. The overall aesthetic of the website is quite simple, you tend to see surveillance camera footage from the space. The rest of the website is staying as a close as possible to RGB colors [the RGB color model for HTML 3.2 though it had been in use for some time before that] to give it an early computer aesthetic. F-D: Do you think that this project space has a general thematic preference? Or does it change from exhibition to exhibition. Maxime: It changes. I see it as a sort of box or space within which an artist can create something different, or how I can see a specific group exhibition. As for example I did with the audiobook Venusia by Mark von Schlegel. Every project has it’s own theme but they do generally center around technology, time, space and our relation to all these things and our understanding of communication and translation of analog to digital and back. Ilana Saudie, Facewaver (Pink) No 1, 2015. Image courtesy of offspace.xyz. F-D: What other programs, non profits, or locations do you have strong ties to? Maxime: I don’t currently have direct ties with any others, but hopefully that can change when I’m setting up multiple locations. There are a lot of galleries and institutions I do support and follow. Maxime: A chat with the artist, usually via email. Then a studio visit usually follows and begins the creative brainstorming. This then solidifies the exhibition proposal, then execution and done! F-D: You mention ‘creative brainstorming’; how much of your input effects the work that is being produced? Or is this more of a discussing on potential projects the artist can put forth? Maxime: Yes, it’s much more of a discussion over what is feasible due to location, technology, and budget. I hope my input does not inform the work. . . but I’m not sure whether the space, the mediation of the cameras, and the viewpoint of the audience informs the work or not. It’s up to the artist; I’m just the facilitator.There are unwritten boundaries where I will say, “no let’s not do that”, just because the fit with the space, physically or digitally just is not there. I visualize the exhibition before it materializes. Maxime: Of course, I think one way or the other all the things we do now are political in one way or the other, even if we’re apolitical we’re still being political by removing ourselves from the playing field. I have to think a lot lately about the situation during the first World War, when an entire artistic community found its’ way to Zurich to the Cabaret Voltaire where DaDa originated. F-D: Do you see any parallels between the way artists are utilizing the internet for communication today, and artist migrations to art hubs of the past? Maxime: Internet, Social Media and WorldWideWeb definitely made a more nomadic approach possible for a lot of people, not only artists. Artists still migrate, as it is important to be part of a community and that still hasn’t fully transpired to an online variant of that. It’s true you can be part of a group on Facebook or active for a cause, but a real community, one that relies on each other, supports each other is still very physical. Recurrently meeting someone and perceiving this person with in a physical space, rather than a flat image on a screen is still a big difference. The communication between the members of the community has totally transmuted to online behavior. But you could say that video conferencing, a la skype, facetime, or live broadcasting adds an element of “living in the same moment” can be considered similar. F-D: What influences outside the visual arts inspire and impact your approach to designing exhibitions or programs? Maxime: A multitude of different influences. I consider advances in technology, exploration of space / time understanding, literature, music, dance, and architecture. A lot, really. F-D: Can you elaborate on how dance and architecture are influences? Maxime: Dance, music, and theater are influences in that I’m thinking about conceptual pieces: Rosas of Anne Teresa De Keersmaeker, or Jan Fabre with Mount Olympus (24 hour-performance) or even the artist Anna K.E. who is a sculptor but uses her body and movement as a form of sculpting. Architecture in terms of our concept of 3 dimensional space or how we perceive the delimitation of space. I’m more interested in the notions and concepts of these practices that the exact execution of it. They both can serve as a framework wherein new concepts can be developed. Maxime: I make it useful by forbidding access to it and then broadcasting it worldwide in a hope to create a bridge between communities and overcome the physical hinderance of time and space. I do host offline events as well, but they are more centered around meeting each other rather than being in the same space with the art. Maxime: I think my space is very contemporary in its current form. A lot of galleries are rethinking their model and trying to get away from expensive rents— those rents are what is crushing galleries. There is a strong move in culture towards experiencing reality through the mediation of a camera lens or computer screen. I see a lot of people working in VR, online exhibitions, or 360-imaging— but I’m unsure if they are utilizing the full potential of the technology. I’m still waiting on technology to catch up or how we understand the technology so we can use it as a proper channel to distribute a story, an opinion, an artwork, or an exhibition. A lot of the online exhibitions I see, look a lot like book or catalogue presentations. The flatness of the screen is very challenging. We tend to render it into an architectural space through rendering of sophisticated modeling software programs or treat is as a flat piece of paper. Maxime: Whatever is necessary. 🙂 No. . . I tell them I run an online space and work in a gallery. I don’t like that sentence, “what do you do for a living”, it’s so sad. I prefer to look at it in another way: I work full-time in a gallery which allows me to pay for my basic needs and sets the basis for many of the developments that I did so far. I wouldn’t be able to experiment as I like in my full-time job. I would of course prefer to be solely working for Offspace.xyz, but that’s just not possible now. F-D: Trust me, we hate the question too. But it’s a question that is offered up all the time in a variety of situations. I always find the variety of answers, or better yet, how artists answer differently to different people, fascinating. That’s why we always ask— it’s an obvious question that leads us into how the artist perceives the worlds’ perception of them. Maxime: Ha, yes that is a good point. I tend to answer differently as well: it depends on who is asking, what their background is, and whether or not they are a part of the art world or not. So many things go through my brain when someone asks me that question, it’s hard enough just to try and explain it to my parents. Maxime: For one artist’s project, Anouk Kruithof, I set off a smoke bomb, that was a bad idea…. especially in NYC. F-D: I love this answer. F-D: Words of wisdom?… a motto, favorite quote? Maxime: … “always change, change always”… “just get it done”. . . there’s no worse decision than not making one. And the more the things change, the more they stay the same. 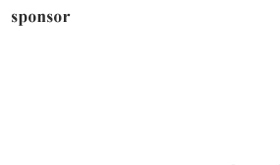 Maxime: Ah yes, I just ran a solo project with Lotte Rose Kjaer Skau. We were live streaming out of her studio in Copenhagen, which started late April. But fingers crossed, this is a new evolution in trying to setup these broadcasts by instructions only. I also just co-curated a solo show, BITTERSWEET, of new paintings and photographs by Lisse Declercq at Loft22 Art Space, with Frédérique Lippens, in Antwerp that is up until June 22. I have a few other ideas popping in my head lately. That’s a constant.